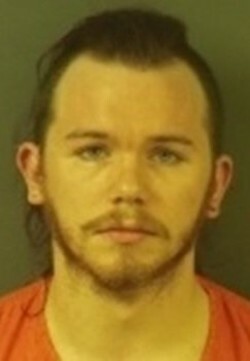 (PUTNAM CO.) - Indiana State Police in Putnam County arrested a 24-year-old man on Saturday after they reportedly found his children living in "very disheveled" conditions. Just after 12:45 p.m., authorities were dispatched to the 300 block of Someday Way near Cloverdale for a report of two small children playing in the street in their diapers. Police said a concerned citizen, who called police, told them they were very unclean and the boys' father walked over and retrieved them prior to ISP arriving on scene. Robert Henline was taken into custody after authorities arrived inside the residence to check on the status of the boys. They also found a 4-month-old infant inside. Police said it had soiled carpets, filthy living area, soiled diapers everywhere, old food scattered and sharp kitchen instruments within reach of the children. ISP charged him with felony neglect of a dependent. The 26-year-old mother assisted DCS with the relocation of the children and is expected to be summoned into Putnam County Court on similar charges.